"...It was inspired by Ron Chernow's masterwork of a biography, but "Hamilton" is many things. A reinvention of the musical. An overdue diversification of a stolid form. A loving tribute to the empty chairs and empty tables of the shows that have gone before. A reminder that America was built by young risk-takers, not serious old white men who stare out at us from currency about to become obsolete. But it is most of all a meditation on that most American of debates - the rewards and limits of ambition and an exploration of what gives us all our best shot at happiness." "...This show, which has captivated the popular imagination in unimaginable ways, taps into the tempo and temper of both the historical and the contemporary in uncanny ways - conjuring a world turned upside down, yet capable of righting itself. A triumph." "...Tipping its hat to the classic musical, "Hamilton" offers a fresh, compelling examination of ambition and legacy, friendship and love, betrayal and forgiveness, revolution and governance. Not only does it pay homage to a Founding Father, a tribute devotees argue is long overdue, but also it portrays the birth of a nation, chronicling how -- "in a world turned upside down" -- rebel leaders turned into statesmen." "...Yet I'd say it's precisely the ugly dysfunction of the moment that's helped turn Hamilton into the sold-out, heavily scalped phenomenon it is. While America gets a nervous tic waiting for the next horror to hit, Lin Manuel-Miranda's musical takes a reassuring step back, not just to celebrate past triumphs but to suggest that everything we're presently going through is tending toward the light." "...So although obtaining Hamilton tickets might be an expensive hassle, the brilliance and emotional power of the work speaks for itself. And more importantly, the historical significance of both the musical and its subject matter make Hamilton feel especially timely for this generation." "...Producers Jeffrey Seller et al have given Chicago a cast that could have opened the show on Broadway. With two-time Tony nominee Joshua Henry as Burr, Tony winner Karen Olivo as Angelica Schuyler, and the estimable Broadway vet Alexander Gemignani as King George, there can be no doubt that was the producers' intention. Equally impressive are the lesser known performers in the cast, including Miguel Cervantes, who has the title role originated by author Lin-Manuel Miranda (IBDB says Cervantes was an alternate in the role this past summer, though that's not included in his credit in this production's program), "American Idol" finalist Ari Afsar as Eliza, Jonathan Kirkland as Washington, Chris De'Sean Lee as Lafayette/Jefferson, and Jose Ramos as John Laurens/Philip Hamilton." "...Yes, Lin-Manuel Miranda's rap, hip-hop and pop-fused opus HAMILTON really is that good. From its opening "pomp and circumstance" notes to its final moment (a gasp of joy from Alexander Hamilton's widow Eliza), the show ignites the stage at the PrivateBank Theatre. It's every bit as good as what you'll see on Broadway." "...Let's not mince words, since we've already spilled so many of them: Hamilton, writer-composer-lyricist Lin-Manuel Miranda's biography of Alexander Hamilton as refracted through a hip-hop, pop and R&B lens, is a sprawling, stunning, singular achievement. By filtering the story of the American Experiment's beginning into modern, meticulously rhymed vernacular and populating the stage with performers of color to play the likes of Hamilton, Washington, Jefferson and Madison, Miranda and his regular collaborators (director Thomas Kail, music supervisor Alex Lacamoire and choreographer Andy Blankenbuehler) make the founding fathers feel fresh and, miraculously, human." "...More than any other show of the last decade, it is the totality of Hamilton that makes it a cross-generational hit, marrying composition, book, sets, costumes and choreography in the most seamless of fashions." "...the show is one high-energy package. From the get-go, it bursts with a youthful vitality that flows from the stage in ever-changing waves. "...But, pulsating to Andy Klankenbuehler's kinetic choreography, Broadway in Chicago's Hamilton is a "non-stop" Pulitzer and Tony-winning musical, not a political testament. A nearly three-hour amusement ride, this is America as seen from the future, not projected from the past. Thomas Kail's faithful staging squeezes the juices from Miranda's R&B magic-making. When it's not S.R.O., there will be dancing in the aisles. It's impossible not to be caught up in the sheer anti-boredom of it all, thrill-making 21st-century theatricality to rechristen the republic." "...Hamilton is a major theatrical achievement that refreshes live stage shows with a 'today' sensibility. It is a 'must-see' event that will grace Chicago for the next year or two. Watch for promotions and special events to help you snag a ticket. Put Hamilton on your bucket list." "...The entire cast is made up of talented performers who are great story-tellers as they bring this story to us through the music and dance as directed by Thomas Kail and Choreography by Andy Blankenbuehler. Joshua Henry's Aaron Burr, Jonathan Kirkland's George Washington and Chris De'sean Lee's Thomas Jefferson were all dynamite. The comic relief in this show is King George, and watching Alex Gemignani play this role is worth the price of admission. He is a delight!" "...At long last history arrives: Lin-Manuel Miranda's course-altering "Hamilton" launches in Chicago not without a touch of Napoleonic ambition, which serves it well for this is no trifling revival or bussed-in tour. This is the show of the moment putting down roots and anchoring itself in the fertile soil of Midwest musical theater. This current iteration lives up to the exospheric hype with which it arrives. And while it may not be Manhattan, nine times a week, until the gods (or their producers) see fit, this is the place to be." "...Backed by an ensemble of gifted, athletic dancer/singers, Thomas Kail's Chicago production is clear-cut, crisp, classy and very smart. Most of all it's entertaining and bridges all generations with its brilliance. 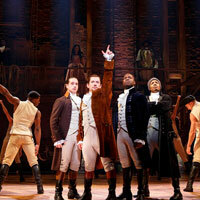 It brings the best of Lin-Manuel Miranda's Broadway production to the Windy City and elevates it even higher. There's not a wrong note, nor a misguided move in this exciting, energized musical. Each performance is a star-making turn and will bring history to life in this very human story of a man with hopes, dreams and lofty ambitions. Audiences who are patient enough to wait for tickets to become available will be supremely rewarded for the time they'll ultimately spend in the room where it happens." "...I could go on and on about HAMILTON. I loved it hard! I want to see it again and probably again and again and .... ! Miranda has weaved these real people's lives together in a brilliant musical tribute. To experience it once is to glean the mere surface of these stories. HAMILTON has usurped "Les Miserables" as my favorite musical. The tickets are hard to get but worth the effort. I highly highly recommend HAMILTON." "...The mesmerizing production opened its new Chicago company's indefinite engagement October 19 on the heels of a Broadway run that gave Times Square ticket brokers greater retirement security than Wall Street stock brokers. It also swept this year's Tony's, earned Miranda a Pulitzer Prize, grabbed a Grammy, gave birth to a cottage industry of books and paraphernalia, ushered in a new era of Broadway stars (including Libertyville native Phillipa Soo) and established itself, squarely, as THE musical of this generation." "...There is probably no theatre fan alive who has not by now heard of Lin-Manuel Miranda's Tony Award-winning musical Hamilton, currently in an open run at what is now called the CIBC Theatre (formerly the Private Bank Theatre). The only question anyone might be asking at this point, as they listen to their teenagers incessantly singing the songs, is the most important one of all: is this play worth the hype and the tremendous expense of seeing it? Short answer: don't throw away your shot. Having now seen this play for the second time in its Chicago incarnation, I can gladly state that not only is it everything you've heard it is, but it is absolutely game-changing in the world of musical theatre." "...Hamilton gives you something to hope for. His life was filled with turmoil and conflict, and for the most part his life was forgotten. But with this musical we think about who our closest companions are, who we can turn to, who will remember us, who will tell our story. Hamilton is the whole package and will make you want to listen to the soundtrack to experience it again and again."